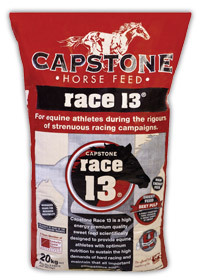 Capstone Race 13® is a high energy, premium quality sweet feed, scientifically designed to provide hi-performance equine atheletes with optimum nutrition to sustain the high demands of hard racing, and maintain that all-important competitive edge. Contains micronized Maize: A patented, relatively new processing technology that greatly increases small intestinal digestibility of maize and reduces the risk of starch overload of the caecum or large intestine. Contains Beet Pulp Shreds: A highly digestible super fibre providing a unique source of energy. High energy feed: Hi-performance nutrition offering a range of different energy sources designed to maximise athletic ability under the rigours of a hard racing campaign. Fully fortified: Contains Stamm 30®, a highly valued source of protein, vitamin and mineral supplement for performance equine athletes. Contains proteinated trace minerals (Copper, Zinc, and Manganese) to increase the bioavailablity of these critical elements. Live Yeast culture: For increased microbial activity in the hindgut which in turn results in increased enzyme production that enhances Phosphorus, Magnesium and Potassium absorption and fibre digestion. High levels of Bioavailable Magnesium: Utilised by horses for increased muscle strength and structural integrity. Also enhances the blood-clotting factor. Added antioxidants: Contains Vitamin E and organic Selenium which help reduce muscle soreness, cell damage and other related disorders. Muesli style sweet feed: Highly palatable and ensures horses “clean up”. Capstone Race 13® contains micronized Maize. Micronizing is a method of processing grains using infrared technology to heat and vibrate the starch molecule, followed by a rolling or flaking process. This dramatically improves the digestion of cereal grains in the small intestine. Increased starch digestion in the small intestine promotes weight gain or growth and reduces the need to feed as much grain, thus reducing the risk of starch overload of the hindgut. Micronized grains are therefore safer to feed. Horses in full exercise, weighing approximately 500kg, will require between 4kg (or 6.5 litres) to 8kg (or 13 litres) of Capstone Race 13® per day. The amount of Capstone Race 13® fed should be varied depending on the exercise intensity, size and body condition of the horse. Capstone Race 13® should be fed in conjunction with a minimum of 1% of the horse’s bodyweight (5kg for a 500kg horse) of good quality roughage such as chaff or hay to provide a fibre source for optimal hindgut health. It is recommended not to feed more than 2.5kg (or 4 litres) of Capstone Race 13® per single feed. rest days. Introduce Capstone Race 13® to your horse’s diet gradually over a period of 4 to 7 days. This feed is not suitable for horses confined to stables and not receiving regular exercise. Micronized Maize, Oats (dressed and clipped), Beet Shreds, Molasses, Canola Oil, Full Fat Soya, Salt, Potassium, Magnesium, Natural Vitamin E, Chromium, Live Yeast, Minerals (including Organic Minerals), Vitamin & Amino Acid Balancer, Stamm 30®, Pellet Supplement.